In a heavily-traveled region such a Southern California, roadway snarls and snags can multiply with startling speed. Which is why Roadway Construction Service (RCS) is ready for anything with a full range of temporary traffic control services. We are never stalled by a traffic safety challenge. 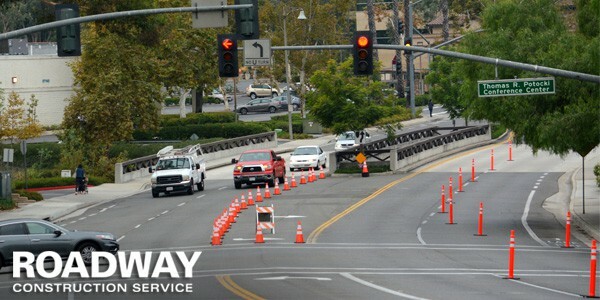 Acclaimed for safety, reliability, and timeliness, our traffic control services cover your project from start to finish. And where we start is long before the crew arrives. Every project begins with an airtight master plan developed by our formidable team of strategists. Loose ends are not an option. What puts RCS planning ahead of the pack? In a word – thoroughness. In our hands, traffic control planning goes well beyond charts and sketches. Committed to maximizing safety and efficiency, our expert planners are hawks when it comes to spotting important details. Leaving no stone unturned, they dig deep to identify all critical facts related to the project at hand. Every variable is examined, from distribution of traffic crews and equipment to safety considerations to expectations of local officials. During the planning stage, RCS strategists interact with municipal decision makers, pinpointing their needs to the finest detail. Once the information hunt is over, the accumulated data is analyzed and solutions are coordinated with the requirements of every entity involved with the project. What are some of the considerations that come into play during the planning process? Crew selection, of course, is one of the main ones. Take our qualified team of flaggers. How many will be deployed, where will they be stationed, and how long will they be needed all are questions we must answer with unfailing accuracy. The same holds true when selecting road barricades. These are crucial for the maintenance of traffic in a work zone or event zone. Fortunately, Roadway Construction Service has fine-tuned the process of barrier selection. It helps to have a very extensive inventory, allowing us to choose the right hardware to ensure maximum functionality and performance. Proper selection requires insight, energy, and experience. Are cones suitable as a barrier in a designated area, or are larger barricades needed. Speaking of large, when it comes to k-rail, we must decide whether to implement concrete or water-filled – or possibly both, if necessary. Clearly, proper selection during the planning stage is crucial to effective temporary traffic control. Closely linked with planning is permitting. As with planning strategies, the permitting process lays the groundwork for future success. At this stage, our designated team must obtain proper authorizations from government officials and other decision makers involved with the project. Fortunately, RCS knows the traffic control permitting territory from one end to the other, an advantage that facilitates prompt responses to all inquiries and requests. One of the most common types of permits is the encroachment permit, among the most crucial components of our temporary traffic maintenance services. Encroachment permits allow work zone traffic control and an event zone to extend into publicly traveled areas, such a roads and sidewalks. Often these authorizations involve a road closure request. We all want to see the holiday parade or ensure the streets are well-paved, right? Well, some sacrifices must take place — sacrifices like temporarily appropriating public areas for use. Despite the potential benefits of a public event or a construction project, it’s not easy obtaining encroachment permits in California. It means restricting access to these often-used parts of the city. After all, motorists and pedestrians still have places to go, like school, work, and most importantly, the local shopping mall. How does a construction project or special event deal with these realities? This is where both our skill and ongoing relationships really make a difference. Often, a provider seeking encroachment permits must jump through hoops and cut through bureaucratic tangles to make any headway. But that still doesn’t guarantee success. The provider still must convince decision-makers that their plan is sound. Otherwise it’s back to the drawing board. Result? Costly delays. It’s a whole different story with Roadway Construction Service. Thanks to our experience and long-standing relationships, we skillfully navigate our way to the goal, veer around obstacles, and reach decision makers with a proposal that meets their established criteria. Basically, we know the territory and the shortcuts. Delays, therefore, are avoided, and time and money saved. Once crucial preparations are completed, RCS is ready to implement a rock-solid traffic management plan. At this stage, a specially-selected crew is deployed to the job site. There, they perform any number of functions, including setting up cones, installing k-rail, and serving as flaggers. Thanks to their thorough training, RCS on-site personnel bring the highest level of efficiency, safety, and responsiveness to every project. Would you like to learn more about our comprehensive traffic control services? Contact RCS at (855) 907-7233 for additional information and answers to all of your questions. 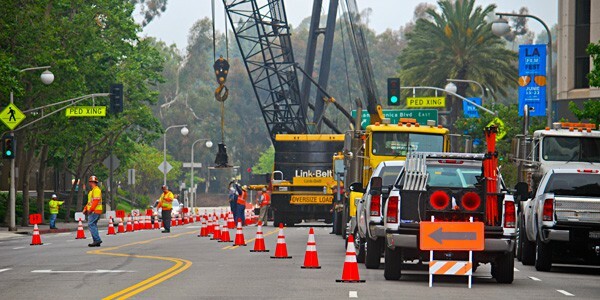 You’ll discover why we set the standard for planning, permitting, and all other traffic control services in Orange County, L.A., and the rest of Southern California.